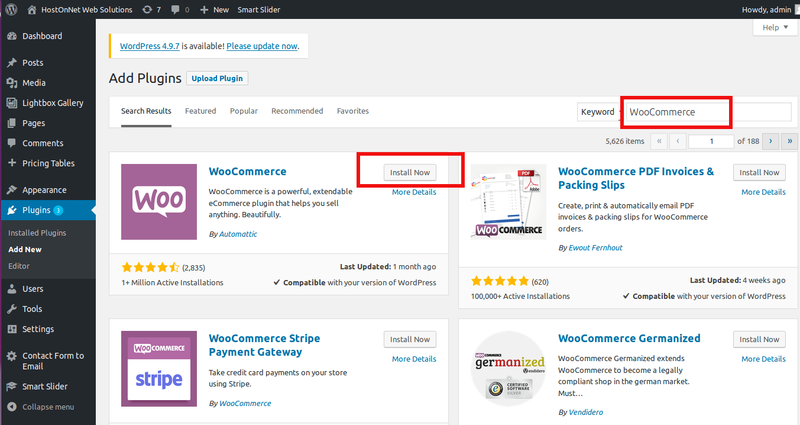 WooCommerce is a free plugin that can be easily installed just like any other WordPress plugin. In this tutorial I will show you how to install it from your wordpress dashboard. First need to log into your WordPress admin panel. Next, look the left side navigation bar and click on Plugins, then on Add New. In this search box, enter WooCommerce, then press Enter Key. You will then be taken to the search results screen. Within your search results, you should see the WooCommerce plugin as the first result. click on Install Now Button. Once the installation has completed, click the Activate button to activate your new WooCommerce plugin. Now WooCommerce plugin is installed on WordPress. ← How to Install a WordPress plugin?